Ever since I made these tasty delights, I've had tons of new traffic to the blog. Thanks to all the wonderful people who commented on that recipe, I have a new - and easy! - recipe for you. All I can say is that it was a relatively effortless meal, which is great for me during the week. John was a happy, happy camper, too. He shouted "awesome!" after his first bite, and he hasn't stopped talking about them since. Normally I would say more, but honestly I'm too tired and I know these will speak for themselves. So make them! *Preheat oven to recommended temperature for biscuits (mine was 350). *Cook ground turkey (or ground beef) on a skillet. You may need to drain, depending on how lean your meat is. While cooking, push biscuits into a muffin pan. Note, you may pull biscuits in half for smaller cups. I show both sizes in pictures below. *Mix ground turkey with BBQ sauce and blue cheese crumbles in a bowl. 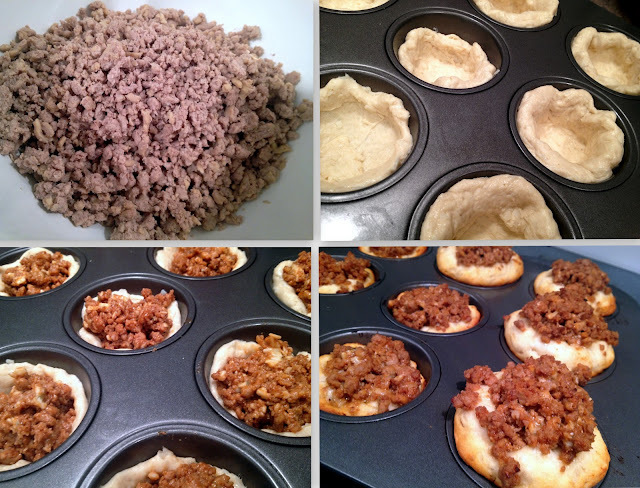 Scoop mixture into biscuit cups. *Bake according to biscuit directions. Note: If you pull biscuits in half you will want to adjust your baking time by about 2-4 minutes (less than recommended time). *Serve burger cups with lettuce, tomato and extra BBQ sauce on the side. Enjoy! These look fantastic! Excited to be your newest follower! New to your lovely blog and I am totally obsessed! Thank you for sharing! I will be checking in again real soon :). It was very nice to meet you! Thanks for following and your kind words - you're too sweet! I'm looking forward to heading over to your blog for more inspiration. :) I hope you enjoyed your weekend! These look fantastic! Thank you for idea. I will definitely try this. Have a good day!